K-Pop rock band CNBLUE played to a sold out Big Top Luna Park in Sydney last night as part of their Blue Moon World Tour. The four heartthrobs of K-Pop was in fine form last night playing many of their hits. This was CNBLUE‘s second visit to Australia and they put on a spectacular show for their many adoring fans. Many thanks to Johnny Au who captured our boys in a great stage 🙂 just hopefully he took many more kkk. Here is snapshoot from CNBLUE official facebook during Blue Moon Taiwan rehearsal, hopefully they will release another back stage photo for Blue Moon Singapore since just now – unexpectedly – Jonghyun just updated their twitter account!!! 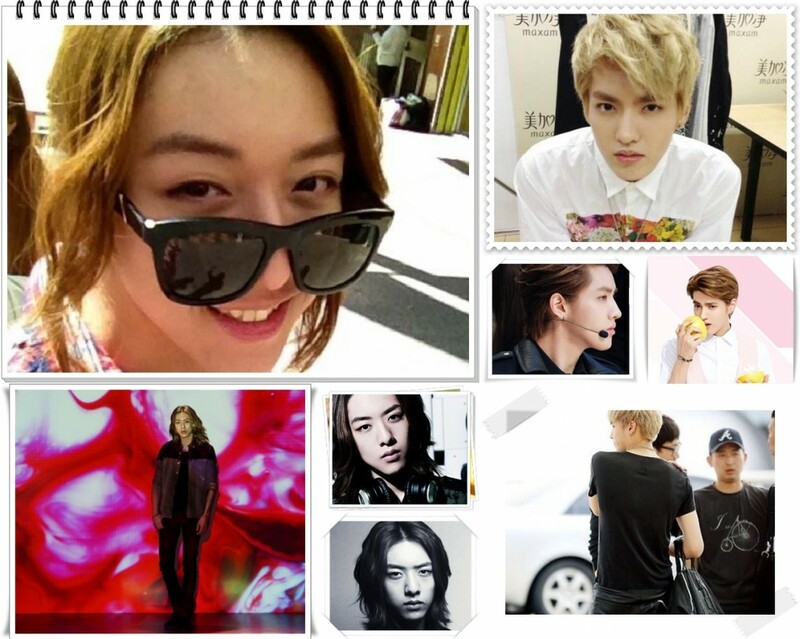 As we ara all know how much Lee Jungshin loves black color and in some pictures here just the another prove of it. He looks stand out with the simple yet half formal style. The most drastically changing within CNBLUE lately is because the movement from Yeungdeungpo to Gangnam. In the previous dorm although we have living room but mostly we are spent the time on our own room. Meanwhile in our new dorm we have big large space of living room, I am pretty happy (laugh). Likely there are many good fortune because a good mood by the new dorm. I am not such a couch potato and used to do activities all day along. I can do martial art and used to do stretching as basic training everyday. The problem is even I want to train everyday CEO and some of the people advise me not to do so much train because they afraid I will injured myself. So, recently I just do weight training (to control the weight). Actually this is a secret but I have “king abs” (means six packs, in Chinese character king=王). Other people probably do not notice it but I have a good body to show off (laugh). What is the thing you have to throw away right now? Who is CNBLUE’s “fashion terrorist”? Who is he? Not me! What kind of super power you want to have. I want to fly; I want to be a bird. What is the most serious thing you do recently? Concert preparation! It’s been a long time not to perform here (in Korea) so I got to prepare it seriously. If you are happening meet your ideal type, what song you want to listen with her? For the ones you love what song you will playing to propose her? What do you want to do on the 2013 January 1st? I want to send messages (a New Year messages) to the people I love. I want to going back home. What do you want to do very firstly once you are in home? I want to take shower. What is the most irritating stuff for you? When is your happiest time? It is when I am sleeping. What did you dreamt last night? When will you become the most talkative? It is when meals time. When do you think Jung Yonghwa looks cool? What is cool? We meet every time, it is just creepy. What is the thing who leaved a deep impression to you back when you were in Singapore? What if you become FNC CEO? I am not the one who suit of become a CEO. Tell me how to live passionately? Enjoy the life itself, love everything in our surrounding. What is your favourite phrase? Lastly, any messages you want to say to Collin? Yonghwa is a reliable elder brother. Minhyuk is a reliable younger brother. Jungshin is a conehead younger brother. I do music and acting recently, I think if the time I have is too limited. But doing both improved my skill and gives me a lot of possibilities in the future. In music for instance, I really think that I am nothing but I do feel challenged to have this opportunity. Because if I keep on explore my basic skill, both music and acting are actually quite fun. Still I think if my real root is music. Guitarist that leaves me a deep impression is Eric Clapton and just like him, I want to be a great elder guitarist. I try to keep flowing as the time change and importantly to be a good-looking man as well, haha. In the past, I used to think “acting is not my field”. Nowadays if I thinking back again, band and acting are two big things who come like lottery in my life, thus far I just doing music and when I made a first leap in acting field as a drama cast, I felt strangeness and completely lost. Since we have debuted we are four experiences difficulties in reunited audiences. With the time goes by it becomes easier and through acting it comes even better. Actually, through acting, people who do not know CNBLUE begun to acknowledged and start to listen to our music (so then we could promote our band to them), that is a good point. Right now, we are four doing both music and acting, it is looks good (because we have more self-confidence). Up to this day, I do not know what people think yet, but I hope they will say, “Very good”. I really want to learn acting from experienced senior actors and crews. As Busan native, I love “Friend” movie, that movie had starred by Jang Donggun senior that is another reason I felt honour to act together with him (Jonghyun referred to A Gentleman’s Dignity he starred with Jang Donggun). The impression during drama filming is fun; I would like to say “pretty good” right from the start-up to the end of the drama. – Blue line is author and translator’s further explanation. Because I have never been visit Guam, I am so envy. If only there is a chance, I want to go with my whole family. I am rarely spending time with my family so I want family holiday. During my childhood, my elder brother had English and Korean course while I had drawing, clarinet and piano. Even though I learn a little English but my focus on art and sport, I even went for vocal training. These should be my mum did not see “academic interest” in me so she picked those kind of courses for me. When I was a trainee, the hardest time for me was the moment I have to stay independently and separate from my family. There was a time I thought about giving up. Every time that thought occurs my parents will come from Busan to Seoul to reassurance me. Asked me to thinking back and carefully before made a decision. When I am playing around with my friends, my parents always said to me not to forget to prepare my future well, those times were over in my twenties. If only I do whatever I want to without thinking properly maybe I become a loser right now. For me, those shoes are? Those shoes are my property, my treasures. If there are people want to gift shoes as a present, our hyung, Jung Yonghwa would be pretty happy ao he has another nickname “Yongyongie”. Is there any thing who makes you happy recently? It should be working along Minhyuk. Is there any moment you want to come to the past the most? The moment I feel so happy. What do you do if you spend a single day on your own? That day, I will create a playlist and lying down when I listen to it. What thing you have not to do yet on 2012? I have not done sky boarding. What do you want to do on 2013, January 1st ? I want to go home, to Busan. What do you do before you are close your eyes (sleep)? Lits up an aromatic candle. When do you want to speak Satoori (dialect)? I used to speak Satoori. What do you think about the new dorm? Have you ever involved in criminality things? When do you think you look cool the most on photo? It is when I am on the stage and singing. When do you think Lee Jonghyun is the coolest the most? I have to think first to find the answer, kkk. Please describe Jung Yonghwa in five words. This moment, what did you do so you want to say sorry? I used all Jungshin’s moisture creams. How do you feel when your self-composed song had chosen as title track? Among those songs you have composed, which one you love the most? Which song you wanted Jonghyun to listen? What if you become FNC Magazine’s Editor in chief? Minhyuk and Jungshin both drown, whose do you choose you save the first? Minhyuk is a poor guy. CNBLUE is groove pop rock band. Of course we are not stick with this kind of style but in 2013, I hope we can proof our colour more than previous years. Despite I, myself who likes many genres so I keen on to make a different colours (many genres of songs), we need a clear style tough (one dominant style so that when people listen to the song they immediately recognize it was CNBLUE’s song even tough the song probably has different style). I think find our true colour is a main CNBLUE’s vision in playing music. For the long-term plan, I want to be vocalist who able to sing a song for a long time. Also, I want to keep perform on the stage along with the other CNBLUE’s members. I keep thinking positive, it gives a big help in my musical industry. With the power of positive thinking, I will show the better CNBLUE’s image. Everyday became pretty interesting because people starting to liking me as “Milk Boy” or “Towel Boy”. My second drama, ‘Heartstring’ boasts his popularity on overseas. Many had asked, ‘didn’t you felt disappointed since in Korea the rating is quite low, but I am satisfied enough when the drama ended and during the drama filming every casts keep thinking positive and push each other, an unforgettable drama. I heard that drama nicknamed “#1 Korean drama in Taiwan. At 2012, I want a free time for myself, some fans asked me, ‘why you didn’t do something?’ but I need some time out after 3 years nonstop working. I never composed song in relax and now I enjoyed the time a lot. During those times I composed about 20 songs. Since I composed for Juniel and AOA and for CNBLUE itself for sure, I am sure I can show the better image. It was exactly what I felt that day, 2010, January 10th. Jung Yonghwa posed on camera naturally. That day he just back from Chile, having very long flight, it was about 30 hours, jetlag and no sleeping yet. Maybe, because it was his first single shoot after quite a long time, rather than shown his tired face, he looked more nervous and excited at the same time. We will show you another Jung Yonghwa’s charm. Although he was a bit nervous with 5:5 hair style, unconventional fashion and meet the staff for the first time but the clumsiness had disappear in just a wink of time, every time we meet he always said, “I’m Jung Yonghwa” (he always introduced himself politely). Judging from what we heard later on, he shown off photo-shoot result to the other members and he had nice sleep that day. – Blue line was further explanation from author and translator.